The Lembest Lechon Business Pilipinas: What Business Ideas are Good to Start in the Philippines? 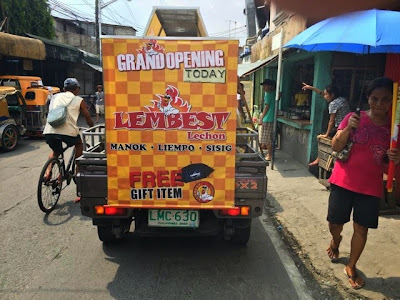 Lembest lechon business in Luzon is a wide food company producer of delicious and quality roasted chicken and pork which started as a childhood dream. An imagination that became a reality firm. The company offers lechon manok, liempo and sisig delights. What Business Ideas are Good to Start in the Philippines? Lechon manok is really a great business ever since. It is serving and providing the masses with quality meat that targets both families and friends. Whom do you know that does not eat lechon? A high rate of Filipinos are carnivorous and they love meat more than lettuce and other veggies but they do eat vegetables every once in a while. Competitors are not a problem if you are wise enough to compete with the market that caters the same product. Everyone wants to earn and you must respect and play the game fair and square. Making your lechon business needs a brainstorm with your partners in order to fulfill success in this new career that you want to pursue. Time is needed and sacrife in different kinds of aspects. One must be seriously ready to do what it takes to make a retailing chicken store. Each and every corner has potential clients for this venture and if we are talking about food, of course everyone eats! This bird is one of the most cheapest and tastiest protein available in palengkes or supermarket and this one can be a good strategy to be sold in an area near you. Creating a delicious recipe that is uniquely prepared should be an individual's goal to cut down the percentage of buyers to love your produc and soon to be patrons of your company. Lechon is the most loved menu during seasonal gatherings and important ocassions. Christmas is were the high sales is going on but that does not mean it only benefits an owner during December. Experiencing this business is the best way to know the statistics and you will be amaze and wonder why Andoks and Baliwag came out with success. It takes courage and patience in doing any business or the sudden change of profession as an entrepreneur but if anyone likes to have more, the key is to provide the needs of tne public or any specific type of audience. Just make sure you are catering the right spectators that will like your food menu. The good thing about lechon is that is not too hard to sell it. At first people will be a little bit hesitant specially if you are a new player in town. Be a friendly neighbor to your prospects and just wait for the right time to make them feel comfortable with the taste and also your branding. Remember that any business will only be at triumph with good marketing and planning. Through intelligent preparation, one can always multiply its income stream wherever he maybe. It can be in the Philippines or international as long as you know how to solve problems for the people. Yes solving there problems and making thing easy for buyers to buy the solution is the way to have greater opportunities for you and your family. Do not be afraid to weak and do not be proud to strong are some of the entrepreneur's mind. Always have a respect for each and everyone no matter what their situation and status is. The life of a business and in this case lechon, is your consumers. Always make them happy and give them what they want in order for them to recall your accomodation and company trademark. The Lembest Food Blog site. lechon business is a common but popular food outlets in the Philippines. It is a proven investment that can create success.